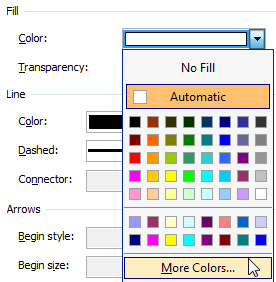 Picking colours for text and backgrounds in Microsoft Office products such as Word, Excel and PowerPoint is usually quite straightforward: you click on a dropdown list, find a colour that you like the look of and click on it! 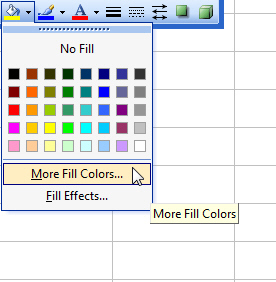 But what if you've used a specific colour in a Word document and you'd like to use exactly the same colour in an Excel spreadsheet? Or what if you've been asked to use your company's corporate colours in a PowerPoint presentation? 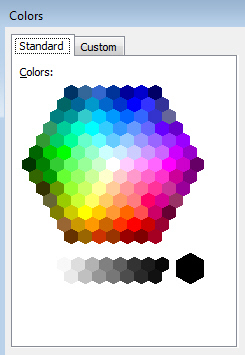 Fortunately, each Microsoft Office product provides you with at least one way of choosing your colours very accurately. Read on to find out how! 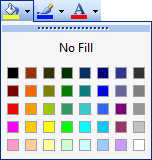 The option you see might be specific to the type of colour you're choosing - such as fill colours. Or it might be just a general More Colors... option like this one. Once you've opened the Colors dialog box you'll usually find two tabs: one called Standard, and the other called Custom. There are 144 colours on the Standard tab - these are made up of 127 colours in the hexagon, and 17 shades of grey at the bottom. 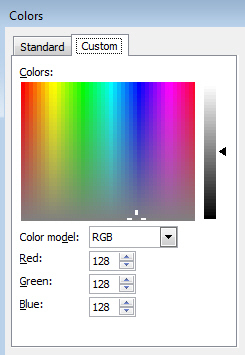 The Custom tab gives you access to 16,777,216 colours in total! In Microsoft Publisher you'll also find a third tab called PANTONE, but you'll learn more about that later. 1. Click on a colour in the grid. 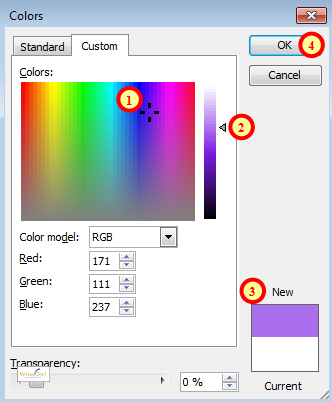 Now that you know a bit about how to choose colours in a basic way, we'll move on to looking at how you can define your colours more accurately using one of the standard color models in Microsoft Office.